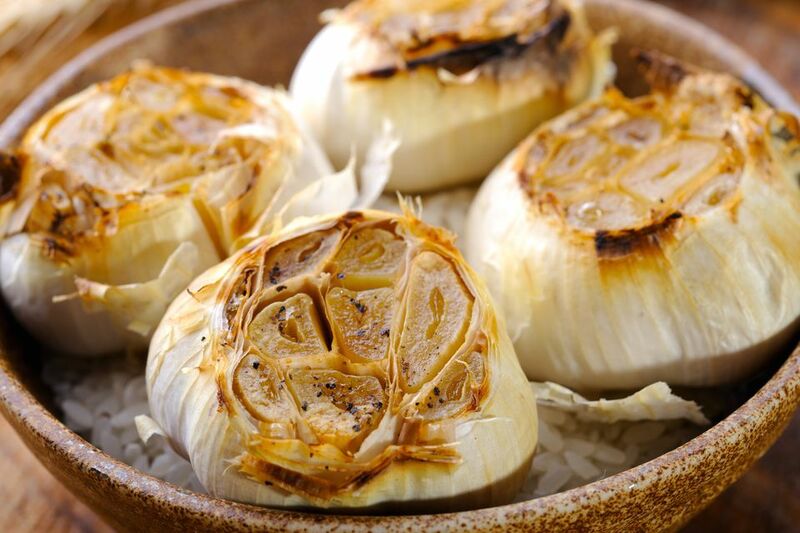 Roasted garlic is a complete transformation of raw garlic. Sweet, mild and delicious, you can use roasted garlic in all kinds of ways, like in pasta sauce, as a topping for pizza, in mashed potatoes, in soups — to name just a few. Roasting garlic takes away all the acridness of raw garlic, leaving in its place something utterly sublime, and yet still magnificently garlicky. Preheat your oven to about 400°F. Slice off the very top of the garlic bulb using a kitchen knife. It's the pointy end you want to trim off, leaving top of the garlic bulb flat and exposing the flesh of the garlic cloves within. Place the garlic on a square of aluminum foil. Drizzle some olive oil over the garlic bulb, particularly the region where the cloves are exposed. Sprinkle a little bit of Kosher salt over the garlic. Loosely close up the foil around the garlic and transfer the whole parcel to the oven. Roast for about 30 minutes or until the cloves are soft. Let the roasted garlic cool for about ten minutes, and then you can take apart the cloves and squeeze the roasted garlic out of the shells of the individual cloves. You can then spread the roasted garlic on crackers or use in your favorite recipe.